Welcome to A10 Talk’s Top 25 Player Countdown. Each day, we publish a new article counting down the 25 best players in the Atlantic 10 this past season. Today, we continue our countdown with #20 Jared Terrell. As a freshman, Jared Terrell showed the Rhode Island faithful that he was there to stay in the Ryan Center and make an impact. When you have a player that helps his team knock off a ranked opponent for the first time since 1998, there is a good chance that he is a special basketball player. Since that outstanding performance on November 22, 2014, Terrell has done damage for Dan Hurley and the Rhode Island Rams. One can only image what he will accomplish in his senior season. To say that #32 of the Rams is a capable shooting guard is an understatement. 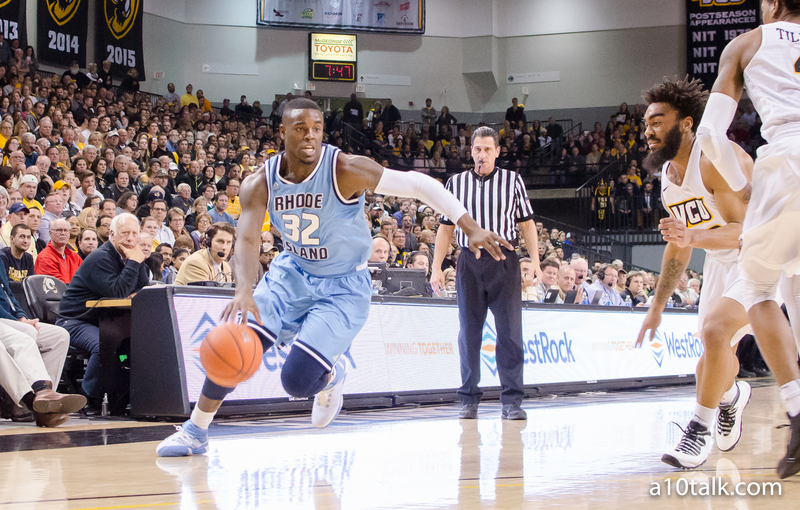 By and large, Jared Terrell has been Rhode Island’s most clutch player since stepping foot on the Kingston campus, and that did not change in the 2016-2017 season. Two times throughout the 2016-2017 season, Terrell hit a season-high of 24 points. First, he achieved the point total at home versus Saint Joseph’s on January 3, 2017. Although all of the URI students were at home and sleeping during winter break, #32 of the Rhode Island Rams was wide awake and lighting up the Hawks. Saint Joseph’s head coach, Phil Martelli, could do nothing but lower his head in disappointment every time Rhode Island’s shooting guard hit one of his five three-point jumpers. On a night in which the Rhode Island men’s basketball team broke the school record for most three-pointers in a single game (16), Jared Terrell was asked about his splendid long range shooting. In response, Terrell told the media at the postgame conference, “It’s just a confidence thing. Once you hit one and see the ball go through, you’re just able to step in with more confidence and just hit.” The Weymouth, Massachusetts native must have been correct because he exhibited his confidence as a shooter all throughout the season. Second, he totaled 24 points at Tom Gola Arena against the LaSalle Explorers on February 21, 2017. Efficiency was the name of the game in this one for Jared Terrell. An 11-16 shooting performance from the field in 35 minutes of game time led to an offensive rating of 146 (according to KenPom). Between Jordan Price, B.J. Johnson, and Amari Stukes, the Explorers had no answer for the shooting guard. In a game that Rhode Island had to have, Terrell led the offensive charge and kept his team in contention for an at-large NCAA tournament bid. In postseason play, Jared Terrell shined when the lights were the brightest. Beginning in the Atlantic 10 tournament, he brought his defensive intensity to help limit the offensive production of Saint Bonaventure and Davidson in the team’s quarterfinal and semifinal matchups. Moving into the Atlantic 10 championship game, Terrell went on an offensive tear on his way to 20 points and he forced the defensive steal that sealed the game for the Rhode Island Rams. Going into halftime with momentum is a major key, and Rhode Island was able to do just that in this game when their starting shooting guard hit a ridiculous, off-balance floater to go into the break with a 40-27 lead. Finally, the Rams traveled to the NCAA tournament for the first time since 1999 off the back of their Atlantic 10 championship victory. In the first round of the tournament, Jared Terrell scored 12 points on 3-8 shooting from the field and securing all six of his free throws. The important effect of Terrell’s play was felt on the defensive end when he shut down Creighton’s Marcus Foster from beyond the arc. Known as a prolific scorer, Foster went 1-7 from three-point range while trying to deal with the physicality of Terrell. Furthermore, in the second round of the “Big Dance”, Jared Terrell gave his utmost effort in trying to carry his team into the Sweet 16 against the Oregon Ducks. The Brewster Academy alumnus paced his team with 15 points, 6 assists, and 4 steals. In many respects, Rhode Island controlled the contest and they reclaimed the lead on Jared Terrell’s pull up midrange jumper, with 3:10 of game time remaining (as seen below). Although the Ducks prevailed in a heartbreaker, no blame could be placed on Rhode Island’s shooting guard. As competitive as college basketball is nowadays, staying healthy is the number one key to attaining success. Although the injury bug decimated Dan Hurley’s basketball team for the second straight season, Jared Terrell stayed durable as ever. On top of playing all 35 games that his team played in, the shooting guard played 76.4% of all minutes that were allotted. In his 35 played games, Terrell produced at a high rate, scoring double-digit points in 23 of the 35 games. Within the 23 contests, he scored frequently against the likes of defensive juggernauts such as Cincinnati, VCU (twice), and Oregon. Overall, he wrapped up his junior season with an average of 12.6 points per game on 41.9% FG and 34.6% 3PT. Rhode Island had a considerably successful 2016-2017 season after winning the Atlantic 10 tournament and progressing into the second round of the 2017 NCAA tournament. The success of the Rams from Kingston, Rhode Island was due in large part to the premier defense and clutch shot-making of Jared Terrell. Going forward, look for Terrell to shoulder the load in his senior season and carry his team to prominence again. Rhode Island fans: Follow @A10TalkURI and check out our forum for more A-10 content.